Covering Cannock, Solihull, Birmingham, Wolverhampton, Lichfield, Sutton Coldfield, Walsall, Stafford, Stone and surrounding areas. HMB Training Services are an Ofqual accredited training provider with extensive experience in delivering first aid training, fire safety training, manual handling, health & safety, safeguarding and Mental Health First Aid courses. 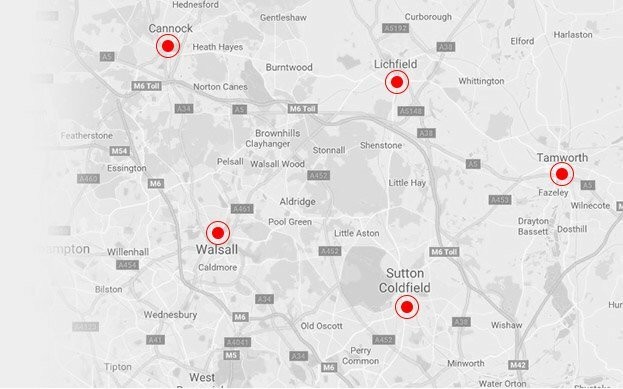 We have numerous training venues for coverage at venues in Cannock, Lichfield, Sutton Coldfield, Solihull, Birmingham, Wolverhampton, Walsall, Stafford and Stone. Our training team can discuss your requirements, and put together a training programme for your workplace. We advise on all aspects of first aid training to create a safer and better working environment for your business. Our qualifications are approved by Qualsafe awards and valid for 3 years. Courses range from basic First Aid Courses for use in the home to First Aid Qualifications tailored for the workplace or for dealing with children and babies. Our mission is to provide fun, practical and cost effective First Aid Courses. See the various types of courses we can offer below. HMB Training Services cover Cannock, Solihull, Birmingham, Wolverhampton, Tamworth, Lichfield, Sutton Coldfield, Stafford, Stone and Walsall. Training can be provided at a location nearby or your home / office for added convenience. Our trainers are enthusiastic and knowledgeable to ensure you get the most out of the day/s. By utilising your venue traveling costs can be kept to a minimum as well as ensuring the training is carried out in comfortable surroundings you are familiar with. For more information on our first aid training, safeguarding, health and safety training courses, please get in contact.